add the sugar and beat using a hand mixer until white and fluffy and doubled in size add the vanilla and slowly add the marsala wine - about a capfull at a time. I like mine quite boozy - so generally add about half a white wine glass of marsala to get the party and guests a rocking and a rolling!! 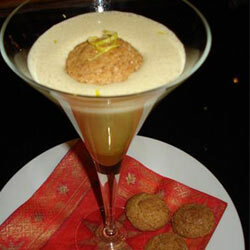 Pour into martini glasses and decorate with a biscuit and some lemon zest and serve immediately. For the hot version of this Italian Christmas classic - place the eggs and sugar in a double boiler - making sure that the bowl does not touch the simmering water - and prepare as above. To view Janice Tripepi's blog click here.